St. Louis is an independent city, separate from St. Louis County in the United States state of Missouri. It is located at the confluence of two of the world's great rivers, the Mississippi River and the Missouri River. St. Louis is the second largest city in Missouri, and is the largest metropolitan area in the state. French explorers arrived in 1673 and found a major center of the Mississippian mound builders. The presence of numerous mounds, now almost all destroyed, earned the later city the nickname, "Mound City." Louis Joliet and Jacques Marquette, both French, traveled through the Mississippi River valley in 1678, La Salle claimed the entire valley for France. He called it "Louisiana" after King Louis XIV of France. The city of St. Louis is named for King Louis IX of France and lies at the heart of Greater St. Louis, a sprawling metropolitan area of nearly three million people. The metropolis lies in both Missouri and the neighboring state of Illinois. The city has a diverse multi-cultural population, and is known for its architecture, festivals, sports, and historical sites, particularly its famous Gateway Arch. Large areas of park land are maintained. 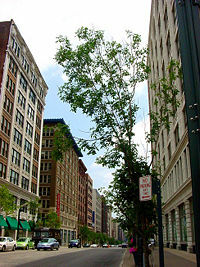 St. Louis received the World Leadership Award for Urban Renewal in 2006 and 2007. At the end of the twentieth and beginning of the twenty-first centuries, St. Louis saw the number of successfully integrated neighborhoods grow. Still, primarily in ethnically mixed areas, pockets of poverty and dilapidated houses remain. The city was ranked as the number four "Most Dangerous" city in the U.S. by one study. In the twenty-first century, St. Louis has transformed from a manufacturing and industrial economy into a globally known focus for research in medicine, biotechnology, and other sciences. The St. Louis region is home to 21 Fortune 1000 companies, nine of which are in the Fortune 500. A simulated-color satellite image of the St. Louis area taken on NASA's Landsat 4. 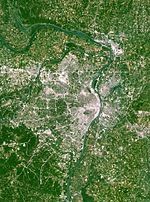 St. Louis has a total area of 66.2 square miles (171.3 km²), of which, 61.9 square miles (160.4 km²) of it is land and 11.0 km² (4.2 sq mi or 6.39 percent) of it is water. The city is built primarily on bluffs and terraces that rise 100-200 feet above the western banks of the Mississippi River, just south of the Missouri-Mississippi confluence. Much of the area is a fertile and gently rolling prairie that features low hills and broad, shallow valleys. Both the Mississippi River and the Missouri River have cut large valleys with wide flood plains. Limestone and dolomite of the Mississippian epoch underlie the area, and much of the city is a karst area, with numerous sinkholes and caves, although many of the caves have been sealed shut; many springs are visible along the riverfront. Significant deposits of coal, brick clay, and millerite ore were once mined in the city, and the predominant surface rock, St. Louis Limestone, is used as dimension stone and rubble for construction. St. Louis lies on the border between humid continental climate and humid subtropical climate and has neither large mountains nor large bodies of water to moderate its temperature. Both cold Canadian Arctic air and hot, humid tropical air from the Gulf of Mexico affect the region. The city has four distinct seasons. The average annual temperature for the years 1970-2000 is 56.3°F (13.5°C), and average precipitation is 37.15 inches (942 mm). The normal high temperature in July is 89°F (32°C), and the normal low temperature in January is 21°F (−6°C). St. Louis experiences thunderstorms on the average 48 days a year. Especially in the spring, these storms can often be severe, with high winds, large hail, and tornadoes. Before the founding of the city, the area was prairie and open forest maintained by burning by Native Americans. Trees are mainly oak, maple, and hickory; common understory trees include Eastern redbud, Serviceberry, and flowering dogwood. Riparian areas are forested with mainly American sycamore. Most of the residential area of the city is planted with large native shade trees. The largest native forest area is found in Forest Park. Large mammals found in the city include urbanized coyotes and occasionally a stray whitetail deer. Eastern gray squirrel, Cottontail rabbit, and other rodents are abundant, as well as the nocturnal and rarely seen opossum. Large bird species are abundant in parks and include Canadian goose, Mallard duck, as well as shorebirds, including the Great egret and Great Blue heron. Gulls are common along the Mississippi River; these species typically follow barge traffic. Winter populations of bald eagles are found near the Mississippi River around the Chain of Rocks Bridge. The city is on the Mississippi Flyway, used by migrating birds, and has a large variety of small bird species common to the eastern U.S.
Frogs are commonly found in the springtime, especially after extensive wet periods. Some years have outbreaks of cicadas or ladybugs. The city of St. Louis is divided into 79 government-designated neighborhoods. The divisions have no legal standing, although some neighborhood associations administer grants or hold veto power over historic-district development. Nevertheless, the social and political influence of neighborhood identity is profound. Some hold avenues of massive stone edifices built as palaces for heads of state visiting the 1904 World's Fair. Others offer tidy working-class bungalows or loft districts. Many of them have endured as strong and cohesive communities. The city operates 105 parks that serve as gathering spots, and contains playground, areas for summer concerts, picnics, baseball games, tennis courts, and lakes. Forest Park is one of the largest urban parks in the world, exceeding Central Park in New York City by 500 acres (2 km²). The Missouri Botanical Garden is one of the world's leading botanical research centers. The Jefferson National Expansion Memorial is a 90.96-acre (368,100 m²) national park located on the downtown riverfront where the city was founded in 1764. It commemorates the westward growth of the United States between 1803 and 1890. The centerpiece of the park is the stainless steel Gateway Arch, which is the most recognizable structure in the city. It was designed by noted architect Eero Saarinen and completed on October 28, 1965. At 630 feet (192 m), it is the tallest man-made monument in the United States. Located below the Arch is the Museum of Westward Expansion. Prior to the arrival of French explorers in 1673 the area that would become St. Louis was a major center of the Mississippian mound builders. The presence of numerous mounds, now nearly all destroyed, earned the later city the nickname of "Mound City." European exploration of the area began nearly a century before the city was founded. Louis Joliet and Jacques Marquette, both French, traveled through the Mississippi River valley in 1673, and five years later, La Salle claimed the entire valley for France. He called it "Louisiana" after King Louis XIV; the French also called their region "Illinois Country." In 1703, Catholic priests established a small mission at what is now St. Louis. The mission was later moved across the Mississippi to what is now Illinois. 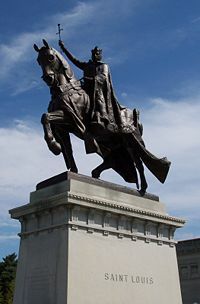 Apotheosis of Saint Louis, a bronze statue of the city's namesake on horseback, was widely used as a symbol of the city before construction of the Gateway Arch. 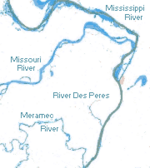 In 1763, Pierre Laclède de Liguest, his 13-year-old stepson, and a small band of men traveled up the Mississippi from New Orleans to found a post to take advantage of trade coming downstream via the Missouri River. In November, they landed a few miles downstream of the river's confluence with the Missouri River at a site where wooded limestone bluffs rose forty feet above the river. Early the next year, the men returned to begin construction at the new site, laid out in a grid pattern in imitation of New Orleans. Development, particularly economic development, clustered around the settlement’s Mississippi River bank on what was called "the levee" and is now called "the landing." This long, smooth bank of land, which would later be paved with cobblestone, sloped into the river at an incline that was gradual enough to permit the river vessels of the time to beach on it to be unloaded and loaded. All products at this time were shipped to and from New Orleans, orienting St. Louis' eighteenth century trade north-south. The settlement began to grow quickly after word arrived that the 1763 Treaty of Paris had given Britain all the land east of the Mississippi. Frenchmen who had earlier settled to the river's east moved across the water. In 1765, St. Louis was made the capital of Upper Louisiana. From 1766 to 1768, St. Louis was governed by the French lieutenant governor, who was appointed by the leading residents of St. Louis. After 1768, St. Louis was governed by a series of governors appointed by Spanish authorities, whose administration continued even after Louisiana was secretly returned to France in 1800. The town's population was then about one thousand. In 1780 St. Louis was attacked by the British during the American Revolution. A combined Spanish and French Creole force protected the city. St. Louis was acquired from France by the United States under President Thomas Jefferson in 1803, as part of the Louisiana Purchase. The Lewis and Clark Expedition left the St. Louis area in May 1804, reached the Pacific Ocean in the summer of 1805, and returned on September 23, 1806. 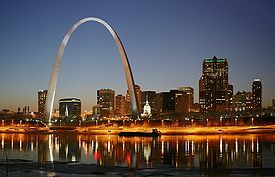 St. Louis first became legally incorporated as a town on November 9, 1809. After Missouri became a state in 1821, St. Louis was incorporated as a city on December 9, 1822. A U.S. arsenal was constructed at St. Louis in 1827. The steamboat era began in St. Louis on July 27, 1817, with the arrival of the Zebulon M. Pike. Steamboats permitted much more efficient and dependable river transportation. Unlike the hand-propelled barges and keel boats that preceded them, steamboats could travel upriver, against the current, just as easily as downriver. Rapids north of the city made St. Louis the northernmost navigable port for many large boats. The Pike and her sisters soon transformed St. Louis into a bustling boom town, commercial center, and inland port. By the 1830s, it was common to see more than 150 steamboats at the St. Louis levee at one time. By the 1850s, St. Louis had become the largest U.S. city west of Pittsburgh, and the second-largest port in the country, with a commercial tonnage exceeded only by New York's. Immigrants flooded into St. Louis after 1840, particularly from Germany, Bohemia, and Ireland, the last driven by a potato famine. During Reconstruction, rural southern blacks flooded into St. Louis as well, seeking better opportunities. The population of St. Louis grew from less than 20,000 in 1840 to 77,860 in 1850, to more than 160,000 by 1860. Later in the century, Italian immigrants began to arrive. Two disasters occurred in 1849: A cholera epidemic killed nearly one-tenth of the population, and a fire destroyed numerous steamboats and a large portion of the city. After the fire, St. Louis' population decentralization westward accelerated, a pattern of migration and development that continues today. Militarily, the Civil War barely touched St. Louis; the area saw only a few skirmishes, in which Union forces prevailed. However, the war shut down trade with the South, as Union troops blockaded the Mississippi River from 1861 through the end of the war. Trade in St. Louis declined to about one-third its average, as the economy of the South, one of the markets St. Louis depended on, was devastated. Missouri was nominally a slave state, but its economy did not depend on slavery. It remained loyal to the Union throughout the Civil War. Eads Bridge, the first road and rail bridge to cross the Mississippi River, was completed in 1874. On August 22, 1876, the City of St. Louis voted to secede from St. Louis County and become an independent city. At that time the county was primarily rural and sparsely populated, and the fast-growing city did not want to spend its tax dollars on infrastructure and services for the inefficient county; the move also allowed some in St. Louis government to increase their political power. This decision later haunted the city, as the results of that separation remain problematic today. By the time of the 1900 census, St. Louis was the fourth-largest city in the country. In 1904, the city hosted its second World's Fair, which led the Olympic Games to be moved from Chicago, originally selected to host the games, to St. Louis to coincide with the Fair. St. Louis developed a lively immigrant gang culture by the early twentieth century, which led to much bootlegging activity and gang violence. Although St. Louis did not segregate people on street cars like other cities, racial discrimination in housing was commonplace, and discrimination in employment was not uncommon before World War II. During World War II, the NAACP successfully campaigned, through protests and picket lines, to persuade the federal government to allow African Americans to work in war plants. Some 16,000 jobs were gained in this way. State court rulings and local civil rights campaigns in the two decades after the war challenged the legality of race-based restrictions on real estate ownership and opened clerical positions in places such as local banks. St. Louis, as did many other Midwestern cities, experienced major expansion in the early twentieth century due to the formation of many industrial companies, and reached its peak population at the 1950 census. The Gateway Arch was built in the mid-1960s. In the postwar era, suburbanization in conjunction with the GI Bill, interstate highway construction, and changes in housing preferences shifted the population out of the city and into newly formed suburbs. The early twenty-first century saw revitalization in Downtown St. Louis and along a corridor extending to the west. The St. Louis Cardinals' new Busch Stadium opened in 2006. Because of the major upturn in urban revitalization, St. Louis received the World Leadership Award for Urban Renewal in 2006. The City of St. Louis has a mayor-council type of government, with legislative authority vested in a Board of Aldermen and the mayor having primary executive authority. The Board of Aldermen is made up of 28 members (one elected from each of the city's wards) plus a board president who is elected city-wide. Unlike many other cities, the mayor shares some executive authority with 9 other independent citywide elected officials, including a treasurer, comptroller, and collector of revenue. These officials have significant influence. By custom and tradition the individual aldermen have a great deal of influence over decisions impacting the ward they represent on matters ranging from zoning changes, to street resurfacing. The Democratic Party has dominated St. Louis city politics for decades. The city has not had a Republican mayor since 1949 and the last time a Republican was elected to another city-wide office was in the 1970s. As of 2006, 27 of the city's 28 Aldermen were Democrats. Although St. Louis City and County separated in 1876, some mechanisms have been put in place for joint funding management and funding of regional assets, such as cultural institutions. Similarly, the Metropolitan Sewer District provides sanitary and storm sewer service to the city and much of St. Louis County. Many well-known U.S. corporations make St. Louis their home. The city is well known as the home of Anheuser-Busch Breweries; however Anheuser-Busch was acquired by the Belgium-based beer company Inbev in the summer of 2008. Local brokerages Stifel Nicolaus and Edward Jones, as well as online brokerage firm Scottrade plus Wachovia Securities (formerly A.G. Edwards, merged into Wachovia Corporation) are major players on the national financial landscape. It is also the site for the world headquarters of Energizer, the battery and flashlight company as well as parent company of Playtex and Shick. Neighboring suburbs host Monsanto, formerly a chemical company and now a leader in genetically modified crops, and Solutia, the former Monsanto chemical division that was spun off as a separate company in 1997. Express Scripts, a pharmaceutical benefits management firm, has its corporate headquarters in the suburbs of St. Louis. Hardee's corporate headquarters lies in the metro area. Enterprise Rent-A-Car is headquartered in Clayton. Emerson Electric is headquartered in the north side of St. Louis. Charter Communications, the nation's fourth largest broadband communications company, is also headquartered in suburban St. Louis. The corporate headquarters of Medicine Shoppe International, a subsidiary of Katz Group of Companies makes its home in the western suburbs. St. Louis is home to railway car plants; two Daimler-Chrysler plants in the nearby suburb of Fenton, where minivans and pickup trucks are built; a General Motors plant in suburban Wentzville. In 1997, St. Louis-based McDonnell-Douglas merged with Boeing. With the new corporate world headquarters in Chicago, St. Louis became the divisional headquarters for Boeing's $27 billion-per-year Integrated Defense Systems unit and home for the company-wide R&D unit, Phantom Works. Boeing manufactures the F/A-18 Super Hornet, F-15 Eagle, and JDAM smart bombs in the St. Louis region, and has developed—at times secretly—several unmanned combat air vehicles (UCAVs). The region has built up a formidable health care industry. This is dominated by BJC HealthCare, which operates Barnes-Jewish Hospital and St. Louis Children's Hospital, plus eleven others. BJC benefits from a symbiotic relationship with Washington University School of Medicine, which is a major center of medical research. Other major players include SSM Health Care, St. John's Mercy, and the Tenet Healthcare Corporation chain. In addition there is Saint Louis University School of Medicine, which is a leader in several areas of medical research and works with hospitals including Cardinal Glennon Children's Hospital and Saint Louis University Hospital. St. Louis is also home to two companies that produce radiation therapy planning software, CMS, Inc. and Multidata Systems International. St. Louis housing costs are significantly (30.7 percent) below the national average ($217,200). From the mid-1990s onward, the City of St. Louis has seen a major surge in housing rehabilitation as well as new construction on cleared sites. As a rule, other costs of living also are at or slightly below the national average. Wages tend to reflect these facts, likewise being at or slightly below the average. 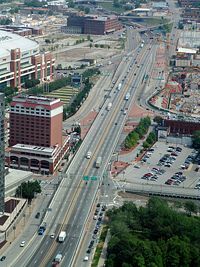 St. Louis is serviced by many interstate freeways , as well as numerous state and county roadways. Lambert-St. Louis International Airport is located in suburban northwest St. Louis County, but is owned and operated by the City of St. Louis. Public transit serving the St. Louis area is predominantly provided by Metro, a bi-state agency that operates most of the region's bus system and MetroLink, the region's light-rail system. Passenger train service is available via Amtrak to Chicago, Kansas City, and Texas from the St. Louis Amtrak station. Like other large American cities, St. Louis experienced a large population shift to the suburbs in the twentieth century; first because of increased demand for new housing following the World War II, and later in response to demographic changes, namely white flight, in existing neighborhoods. The St. Louis Metropolitan Statistical Area. 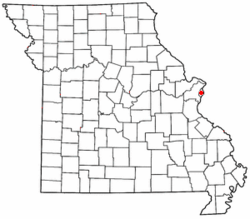 As a result, the St. Louis Metropolitan Statistical Area is the largest Metropolitan Area in Missouri, and the 18th largest in the United States, and had an estimated total population of 2,866,517 as of July 1, 2007. The long-standing population decline of the city has begun to reverse itself in recent years. In 2000, the population was 348,189. As of 2006, the population of St. Louis had shown a small increase to 353,837. As of the census of 2000, there were 147,076 households and 76,920 families residing in the city. The population density was 5,622.9 people per square mile (2,171.2/km²). The racial makeup of the city of St. Louis (as separate and distinct from St. Louis County and the rest of the MSA) was 51.20 percent African American, 43.85 percent white, 1.98 percent Asian, 0.27 percent Native American, 0.03 percent Pacific Islander, 0.80 percent from other ethnic groups, and 1.88 percent of two or more ethnicities. Hispanic or Latino of any ethnic group were 2.02 percent of the population. Historically, North St. Louis City has been primarily African American and South St. Louis City has been primarily European American. Since the mid-1990s, an estimated 35,000-45,000 Bosnian immigrants have settled in South St. Louis, making St. Louis one of the largest enclaves of ethnic Bosnians in the country. St. Louis dropped from the number one "Most Dangerous" city in America in 2006 back to the number four spot in 2008. Overall crime dropped 15.6 percent in 2007, reaching a 35-year low, but homicides increased by 7 percent to total 138.. As of early December 2008, St. Louis had had 157 homicides in 2008, 33 more than 2007. Reports such as these have long given St. Louis the perception of being a high-crime area. For the past 25 years, St. Louis has a number of successful integrated neighborhoods in the "central corridor." Overall, however, the city's African American population is concentrated in north St. Louis city. Although some northern St. Louis neighborhoods are stable and have a large number of middle-class residents, many isolated neighborhoods suffer from poverty, unemployment, crime, and dilapidated housing. More recently, a number of near southside neighborhoods have also successfully integrated. These areas have seen an influx of residents of various ethnicities, including Vietnamese and other immigrant groups. The 168 year old St. Louis Public School District controls the 92 schools in the public school system. With more than 38,000 students, the district is the largest in the state of Missouri and the 108th largest in the nation. The district is currently pushing ahead with its 2011 initiative, which calls for improved graduation rates, higher test scores, and stronger student attendance. St. Louis has an abundance of private high schools, both secular and religiously affiliated, including a multitude of Catholic high schools. The St. Louis Metropolitan Area has the most Catholic high schools in the nation, and a host of other denominational secondary private schools. According to the U.S. Census Bureau, 21.4 percent of the adults in St. Louis holds a bachelor's degree, compared with the national average of 27 percent. Almost 209,000 students were enrolled in the area's nearly 40 colleges, universities, and technical schools in 2008. The city has the largest community college system in the state of Missouri. Washington University in St. Louis and Saint Louis University are the two largest private universities in St. Louis, though most of Washington University is in St. Louis County. St. Louis is also home to Concordia Seminary, the oldest and largest Lutheran seminary in the United States. Outside the city, the University of Missouri–St. Louis is the major public university in Greater St. Louis and more than 20 percent of all St. Louis area residents with a bachelor's degree attended UM-St. Louis. There are many museums and attractions in the city. The St. Louis Art Museum, located in Forest Park, houses an impressive array of modern art and ancient artifacts, with an extensive collection of master works of several centuries. The privately owned City Museum offers a variety of interesting exhibits, including several large faux caves and a huge outdoor playground. The Missouri History Museum presents exhibits and programs on a variety of topics including the 1904 World's Fair, and a comprehensive exhibit on Lewis and Clark's voyage exploring the Louisiana Purchase. Laclede's Landing is a downtown entertainment district with restaurants and nightclubs. Lewis and Clark sculpture on the riverfront. St. Louis Union Station is a National Historic Landmark that includes a hotel and shops. St. Louis is home to the Saint Louis Symphony Orchestra, which was founded in 1880 and is the second oldest orchestra in the nation. The Opera Theatre of Saint Louis is an annual summer festival of opera performed in English. St. Louis has long been associated with great ragtime, jazz and blues music. Early rock and roll singer/guitarist Chuck Berry is a native St. Louisan and continues to perform there several times a year. Soul music artists Ike Turner and Tina Turner and jazz innovator Miles Davis began their careers in nearby East St. Louis, Illinois. St. Louis has also been a popular stop along the infamous Chitlin Circuit. It is because of this musical tradition that the city's National Hockey League team, added in the 1967 NHL expansion, was named the St. Louis Blues. St. Louis is home to over 81 theater and dance companies. The theater district of St. Louis is in midtown, which is undergoing a major redevelopment and building boom. The district includes the Fox Theatre, one of the largest live Broadway theaters in the United States; Powell Symphony Hall, home of the St. Louis Symphony Orchestra; the Saint Louis University Museum of Art; and many others. The city of St. Louis has earned 12 professional sports championships. The St. Louis Cardinals, one of the oldest franchises in Major League Baseball, have won 10 World Championships, second only to the New York Yankees. 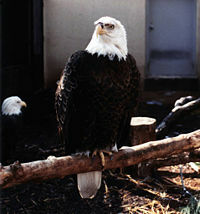 Bald Eagle at the St. Louis Zoo. St. Louis dropped to the fourth-place ranking in CQ's annual list of "Most Dangerous Cities" for 2008, behind New Orleans, Camden, New Jersey, and Detroit. In response to constantly being told people would not be involved in criminal activity if they could find a job, police organized a career fair in north St. Louis. Nevertheless, frustration is building at the police department's seeming inability to make inroads in the number of homicides. In December 2008, an alderman from the north St. Louis ward called on residents to arm themselves to protect their lives and property. Alderman Charles Quincy Troupe said police are ineffective, outnumbered, or don't care. "It's clear the economy is going to get worse, and criminals are getting more bold," Troupe was quoted as saying. He added that residents had been told there was nothing [the police] could do to protect us and the community … that [they] didn't have the manpower." On the positive side, the St. Louis area has made tremendous strides in remedying pollution compared to other metropolitan areas. Missouri requires gasoline stations in the metro area to sell special, reformulated gasoline. Most cars owned by residents of St. Louis and the surrounding counties must pass a pollution test every other year. St. Louis recently became one of the first cities in the country (prior to New York, Chicago, and San Francisco) to be recognized by the United States Green Building Council as having a LEED for Homes Platinum residence. The regional realtor multiple listing service was just the third system in the country to add green home attributes and certifications (LEED-H, HBA-GBI, and Energy Star) as search criteria. This is evidence of "green building" in the metro area. In 2006 the U. S. Census Bureau reported St. Louis had a net population gain of 5,648 from the 2000 census, to 353,837, the first gain the city has had since 1950. However, since then, Missouri released census estimates projecting the city will lose 3,000 residents by 2030. 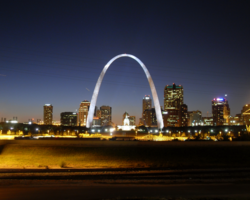 ↑ St. Louis United States – Visiting the Gateway to the West. Globosapiens.net. Retrieved March 14, 2011. ↑ St. Louis Public Library, Mound City. Retrieved June 12, 2012. ↑ St. Louis City, Missouri – Population Finder – American FactFinder. United States Geological Survey (October 24, 1980). Retrieved December 23, 2008. ↑ U.S. Census Bureau (July 2011). Population Estimates by County. Retrieved June 12, 2012. ↑ Canty and Associates, Historical Weather for St. Louis, Missouri. Retrieved November 28, 2008. ↑ Hoffhaus, Chez Les Canses: Three Centuries at Kawsmouth (Kansas City: Lowell Press, 1984, ISBN 0913504912). ↑ Scott K. Williams, 1999, Attack On St. Louis: May 26, 1780, USGenNet. Retrieved November 28, 2008. ↑ 8.0 8.1 Campbell Gibson, June 1998, Population of the 100 Largest Cities and Other Urban Places: 1790 to 1990, U.S. Census Bureau. Retrieved November 28, 2008. ↑ International Olympics Committee, 1904 Summer Olympics. Retrieved November 28, 2008. ↑ Spence Jackson, Steinhoff Congratulates St. Louis on Receiving Urban Renewal Award, Missouri Department of Economic Development. Retrieved November 28, 2008. ↑ Sperling's Best Places, St. Louis, Missouri. Retrieved November 28, 2008. ↑ Missouri Census Data Center, Missouri Population Estimates. Retrieved November 29, 2008. ↑ Olivia Miller, Bosnian Americans, Countries and their Cultures. Retrieved November 29, 2008. ↑ Kansas City Star, January 13, 2008, St. Louis reports 15.6 percent drop in crime. Retrieved January 23, 2008. ↑ ESPN MLB, World Series Winners. Retrieved November 29, 2008. ↑ FOX News Network, December 2, 2008, St. Louis City Leader Says Police Ineffective, Tells Residents to Get Armed. Retrieved December 10, 2008. ↑ Missouri Office of Administration, Population Projections—Total Population, Missouri Counties: 2000 through 2030. Retrieved November 29, 2008. Benfield, F. Kaid, Jutka Terris, and Nancy Vorsanger. 2001. Solving Sprawl: Models of Smart Growth in Communities Across America. New York, NY: Natural Resources Defense Council. ISBN 9781893340336. Kimbrough, Mary, and Margaret W. Dagen. 2000. Victory Without Violence the First Ten Years of the St. Louis Committee of Racial Equality (CORE), 1947-1957. Columbia: University of Missouri Press. ISBN 9780826262707. Lewis, Meriwether, William Clark, and Bernard Augustine De Voto. 1953. The Journals of Lewis and Clark. Boston: Houghton, Mifflin. ISBN 9780395076071. Pochmann, Henry A., Henry Conrad Brokmeyer, Ralph Waldo Emerson, William Torrey Harris, and Georg Wilhelm Friedrich Hegel. 1948. New England Transcendentalism and St. Louis Hegelianism; Phases in the History of American Idealism. Philadelphia: Carl Schurz Memorial Foundation. All links retrieved October 14, 2016. History of "St. Louis, Missouri"
This page was last modified on 14 October 2016, at 15:54.